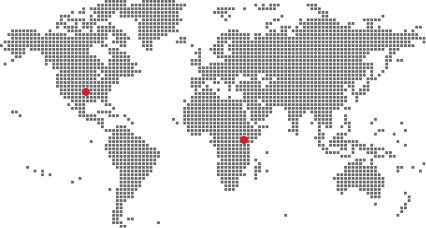 Maisha utilizes six different areas of empowerment to help change the Village of Kano in all aspects. Maisha recently started empowering the community through Small Business Loans. Community members are able to present their business ideas to a “panel” of judges who then decide if their proposal is worthy of investment. If the idea is approved, the business owner is then provided with essentials needed to start a business. 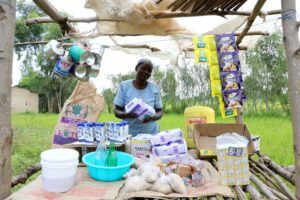 The small business loan recipients are able to provide for their families, while paying back the money to Maisha. Dairy Cows have become a new source of income for Maisha. 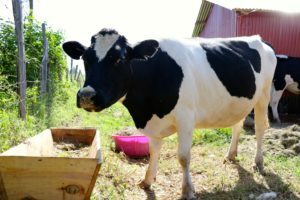 In spring, 2018, Maisha purchased two pregnant dairy cows. The cows have given birth to two calves, and are now producing milk, which will be used as ingredients for the feeding project. The milk will also be sold for profit and to help create a self-sustaining feeding project. The Container Project is one of Maisha’s newest empowerment ventures and will allow Maisha to step outside the Village. Shipping containers, similar to the ones used to transport Christmas Boxes, have been donated and will be converted into storefronts. These shops will be located in town and will create revenue when leased by shopkeepers. With help from Water is Life, Maisha was able to construct a Water Kiosk down the road from Maisha’s Community Center. The Water Kiosk is located at a junction near the Tree of Life and community members will be able to purchase water for a small amount of money. The kiosk will not only give the community a place to get safe, clean water, but will also help generate an income for Maisha. In addition to the Small Business Loans, Maisha also offers a Lease-to-Own Tuk-Tuk and Piki-Piki Project. Community members apply for the program and are given a tuk-tuk (small three-wheeled car) or a piki-piki (motorbike). 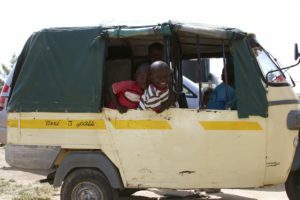 Much like the Small Business Loan project, the tuk-tuk and piki-piki loaners are able to make a living while paying back their loan to Maisha, and once the loan is repaid, they become owners of the vehicles. In 2012, Maisha started the Tailoring Project, which allowed widows from the community to become established, successful seamstresses. The widows use sewing machines to make clothing, school uniforms, purses, headbands, and much more. 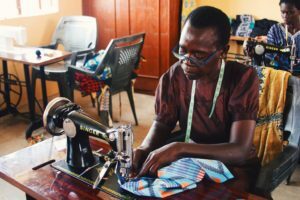 With a total of six sewing machines at Maisha, the widows are able to create products and sell them to the community to make an income for both themselves, and Maisha. Maisha’s goal is to make the Village of Kano self-sustaining and with the growth of these projects, that vision can become a reality. “Our ‘why’ is to empower people to transform themselves. If we can empower them now, in 5 years, I think we will have a community that is independent and thriving. That would really make the self-sustainability part of it amazing, “ said Beatrice Williamson, the Maisha Project Founder. To learn more about the Empowerment Project, visit https://www.maishaproject.org/projects/economic-empowerment/.